This is a long term project to build around 3,000 points of competitive 30K Night Lords for the London Heresy event in May 2017. I plan to go to the event and not look like a noob. So there is a lot involved in this project for me. I will also need some practice games and have had promising responses from other visitors to the Wayland Game Centre in Hockley, Essex. I need to learn a new game system for 30k albeit very similar to 40k. I also have to build a list that is competitive, fun and fluffy and legal. On top of this it has to look good. In the pipeline I have murder packs and warp talons. Im still undecided if my Space Wolf Fellblade will get a repaint. A Sicaran may have to be added for the anti-jink factor and a Storm Eagle is in the post as well. I may need to add some other anti-air as well. I have until May to get this done so we should be OK working around the other projects on the table. 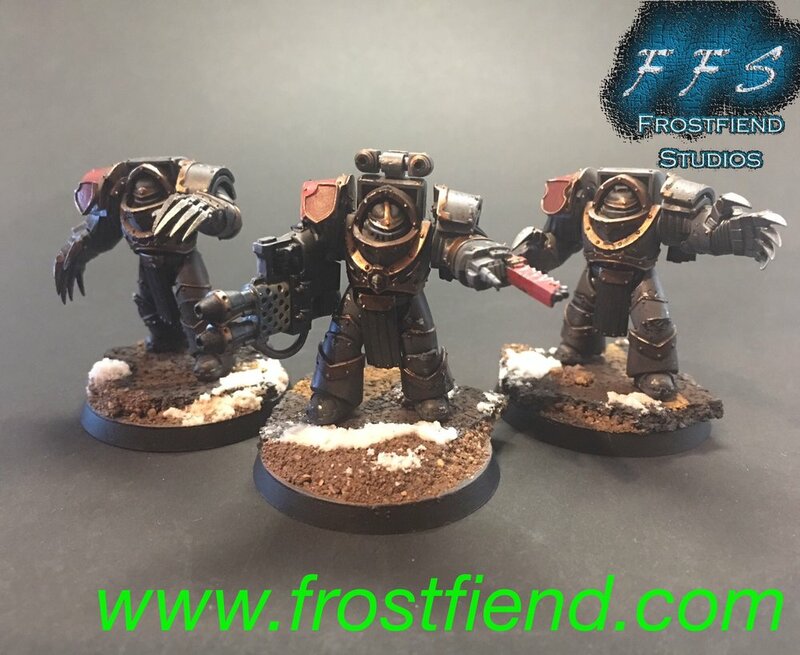 Night Lords update 14th February 2017. Since my last post I have purchased everything for the army. I have based my list around the Terror Assault right of war so the heavy vehicles have been removed from the list for now. In the pile to be built are 3 drop pods a Spartan and 8 terror squad tactical marines. Everything else is built and some of it is even painted. Two big additions to the army are the Storm Eagle and the Deredeo Dreadnought with heavy lascannons. I have had to dip into 3rd party suppliers for some parts of the army. This is mainly for heads and some weapons. I had some reservations about using some of them but once painted they have come out as I hoped they would. I’ve posted some new photos and you will see they are still very much a work in progress but we are getting there. A bit more progress has been made on the army. Not being able to dedicate 100% to it is holding me back but providing a service comes first. I have completed the Deredeo with Heavy Lascannons and have made great progress with the Raptor squad. Most importantly I’m happy with my lightning. It something that I have learned takes a lot of practice and when looking at other work for hints you notice everyone does it differently. Nevertheless after consulting my Guru I’m happy where I am at and am also doing it slightly different to others o they will stand apart. I have used some of the Games Workshop 40k heads and shoulder pads just to mix things up and I am really happy with how they look. I cannot wait to show them off. So there is nothing else to buy now as the last bits have been ordered. These are some Nostraman Chain glaives and some more volkite chargers as you can never have enough of either! Night Lords update 21st March 2017. We are making progress. Slowly, but it is still progress, as I am having to work on them and the other projects that I have on the desk. The Storm Eagle is now base coated and ready for the gloss coats and wash. All the minis are built and in various forms of paint. The Spartan has been washed and trimmed and will be put together soon. A big part of this list is not changing my mind as I go along. When building other peoples models you can get your head turned quite easily by other units that you could drop in to the list. So far my only change has been to the load out of the weapons that the terror squads will use. But those Jet bikes look soooo good! Night Lords update 27th April 2017. The end is in sight. I’m now in the very last stages of getting this force ready for the table top. I am currently working on the last terror squad and then the whole army is finished to a table top standard. This has been a very long journey and I’m actually looking forward to not having to paint them anymore and turning my attention to the other projects that we have on the go. I may spend a little more time on The Night Haunter himself. Conrad Curze is the primarch and the centre point of the army he needs some special attention. So I may take him up a notch or two. Night Lords update 2nd May 2017. Well done to the point that I can put them on the table at the London Heresy at the London GT 2017 and not feel like I haven’t put the work in. The 3,000 points is complete to the point that it is table top ready and fully painted and based with no steps skipped. I’m glad that I’m able to take a break on these for the time being and get to work on the other projects in the queue. We will have to see if they play as good as they look. With a lot of new tournaments fast approaching its time to add to my Night Lords army. most recent is the Javelin. I'm very happy with how this one has turned out.